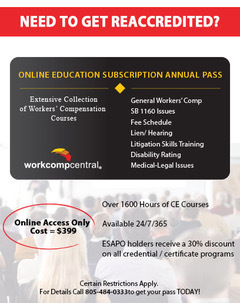 WorkCompCentral is your "go-to" resource for continuing education and training in the workers' compensation industry. CE learning is offered in a variety of settings and a convenient library of online courses is available to you 24/7/365. Over 1,000 hours of workers' compensation CEUs are available with over 400 hours added since January 1, 2012. Education courses are practice-based and are instructed by practicing industry professionals. Our education department is dedicated to keeping educational content up-to-date with the latest in legislative developments and changes in the industry. Our course library is constantly growing to meet the changing needs of every workers' comp professional. Need to educate an entire department? We can provide custom educational content and packages to meet your specific needs. WorkCompCentral training meets California Title 10, section 2592 and Ins Code 11761 and is approved for Broker, Bill Reviewer, Claims Professional, Legal Specialization, MCLE and QME training, when designated for specified course, seminar or training offerings. Provider Numbers: CDI 220098, DWC 1110, State Bar LS/MCLE 12976.